The elephants are coming and they’re stampeding their way towards the back of our truck. 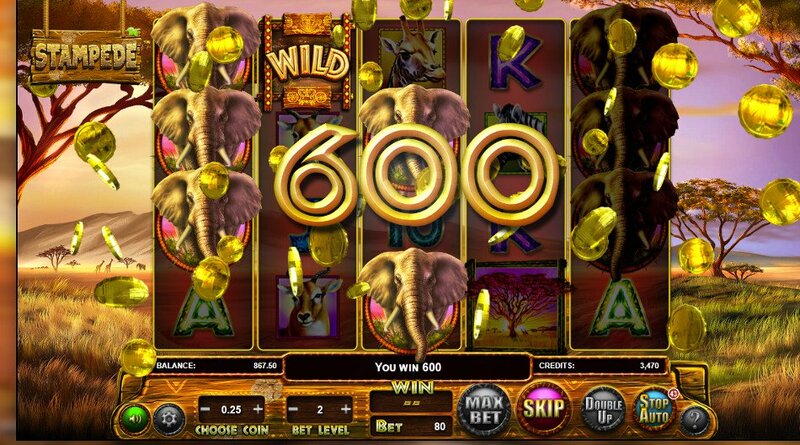 The only way we can escape is by spinning big on this safari-themed 5 reel online slots game designed to get your heart pumping and enjoy the thrill of the chase, Africa style. 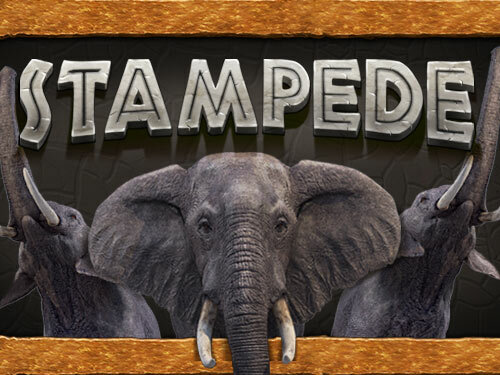 Stampede is a 5 reel online video slots game with 243 pay lines available to play on desktop, mobile and tablet. 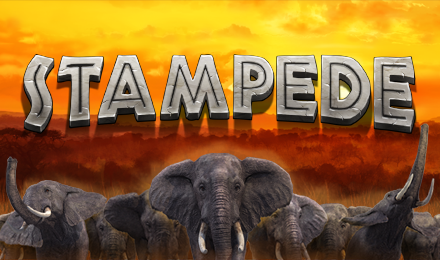 As the name suggests, the game is themed around stampedes and features rampaging animals such as Horses, Rhinos, Elephants, Buffalo and Antelope. The game's backdrop consists of a purple haze of clouds, simulating a dreamlike landscape. Before playing, the player must set their wager using the up and down arrows. This sets the coin value from 0.01 to 2. The game has an “Autoplay” feature, which allows the game to continue automatically for a number of spins predetermined by the player. The symbol for this feature is the two arrows circling each other. In order to set the reels in motion, the player must hit the “Play” button. The game's Wild Symbol is represented by the game's logo and can replace any and all symbols in the game excluding the Scatter Symbol. The Scatter Symbol Is represented by the golden “Bonus” coin symbol and can appear on reels 2, 3 and 4. When the player lands 3 or more of these symbols, they will trigger the Free Spins Feature. When the Free Spin Feature is triggered, the player receives 8 free spins, and a wild symbol will appear on the third reel and stick there. It is possible to land Scatter Symbols during free spins, and if the player lands another 3 Scatter Symbols during one spin, they will retrigger the Free Spins Feature, and gain another 8 free spins. 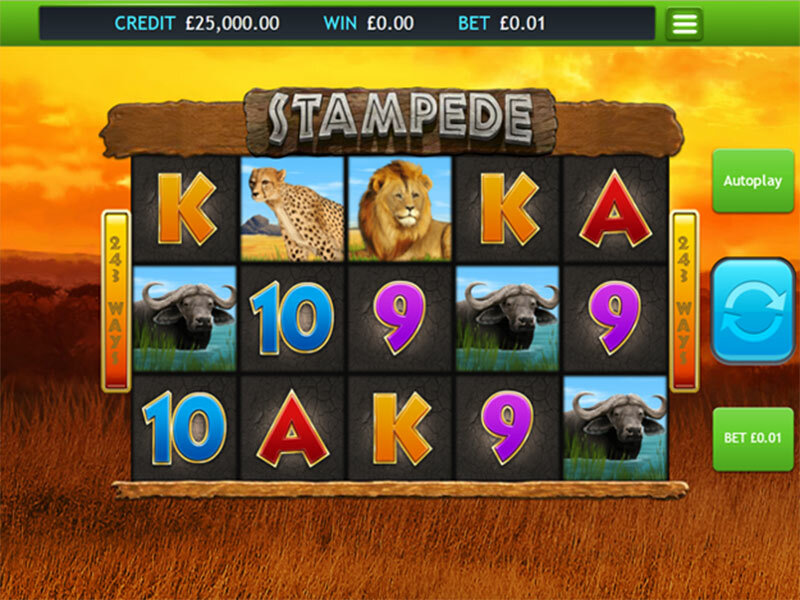 If the player lands any Elephant, Rhino, Buffalo Antelope or Horse symbols on a winning spin along with a wild, they will trigger the Cash Stampede feature. The triggering symbols are held on the reels, and all other positions are respun. Any additional symbols that match the triggering symbols are also held until a respin happens where no more matching symbols land. During this feature, you can activate the Cash Stampede Re-spins feature. The win is determined by the triggering symbols and their matching symbols and is paid after the Cash Stampede is over. Stampede is a well-made game that fits its theme well. Its unique Cash Stampede feature brings a fresh experience for seasoned slots players. The game has a high RTP (Return To Player) of 95.27%, making the game low risk, and friendly to beginners. The lack of ability to select the number of active pay lines adds to the simplicity of the game. The overall layout of the game is clear and the game runs smoothly on all platforms. If you liked Stampede you might also like Odysseus online slots game or to discover more easy slot games Click here.